In a new report on the creative economy, the United Nations Conference on Trade and Development (UNCTAD) found that despite a slowdown in global trade since the 2008 financial crisis, the creative economy has remained robust and has exhibited significant growth. 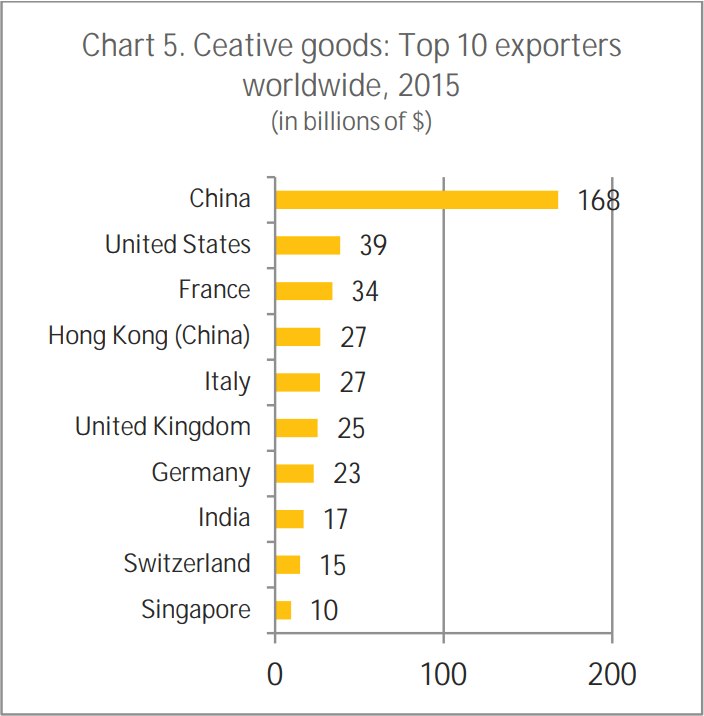 Leading this growth is China, with four times the creative goods exports as the United States in 2015. 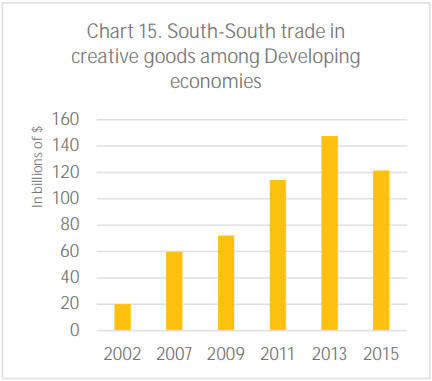 The UNCTAD report Creative Economy Outlook: Trends in international trade in creative industries 2002-2015 [pdf] was released this week. 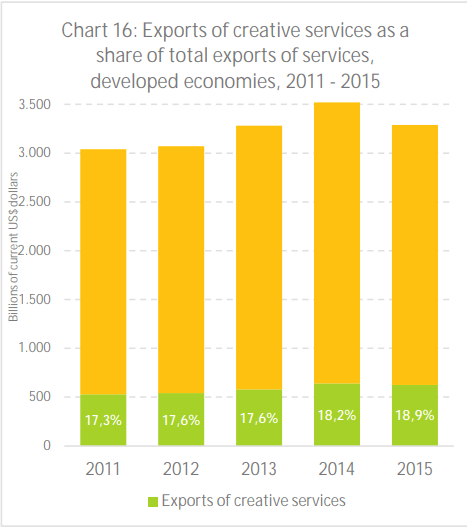 It is the second UNCTAD report on the creative economy, but the first that also tracks trade in creative services, not just goods, according to an UNCTAD press release. In addition to China, the report found that many other developing countries have exhibited significant growth of trade in creative goods during this period, with countries in East Asia and Southeast Asia driving this growth through South-South trade. Trade in creative goods covered by the UNCTAD report fall into the categories of art crafts; audiovisuals; design; digital fabrication; new media; performing arts; and publishing and visual arts. Trade in creative services covered by the report include, but are not limited to, advertising, market research and public opinion services; architectural, engineering and other technical services; research and development services; personal, cultural and recreational services; and audiovisual and related services. "UNCTAD Finds Growth In Global Creative Economy Led By ‘New Breed’ Of Countries" by Intellectual Property Watch is licensed under a Creative Commons Attribution-NonCommercial-ShareAlike 4.0 International License.